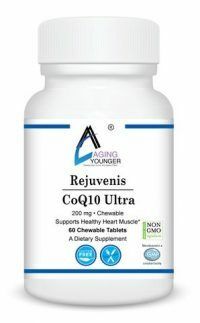 Rejuvenis CoQ10 Ultra Tablet (Co-enzyme Q10) (60-Chewable Tablets to allow absorption through the oral mucosal) is a vitamin-like compound also known as ubiquinone that supports heart, cardiovascular, periodontal and is an antioxidant found in the mitochondria. It supports energy and is an enzyme to produce ATP (Adenosine triphosphate). Ubiquinone combines two terms to describe this substance – quinone is a type of coenzyme and ubiquitous indicates it exists everywhere in the human body. CoQ10 plays an important role in the body’s energy production and is an essential component of the mitochondria, where it helps to metabolize fats and carbohydrates and maintain cell membrane flexibility. CoQ10 is also involved in the production of several key enzymes that are used to create ATP (Adenosine triphosphate), a key energy storage molecule. CoQ10 is absolutely essential for life. Rejuvenis CoQ10 Ultra Is also an effective free radical fighter that may beneficially affect the aging process. As we age, our body’s production of CoQ10 declines by as much as 80%. It is so important to energy production, and therefore lifeitself, researchers believe that this decline may be a factor in the effects of aging on the human body.The highest levels of Rejuvenis CoQ10 Ultra chewable tablets are found in tissues in the body that work the hardest; like the heart, the liver, etc. Initial studies on CoQ10 found that persons with cardiac insufficiency had very low levels of CoQ10, and that supplementation increased CoQ10 levels. CoQ10 Ultra is not only an effective free radical fighter, but it supports cardiovascular health as well, and enhances cerebral and joint health. Does your CoQ10 product contain soy? Rejuvenis CoQ10 Tablet does not contain soy. Rejuvenis CoQ10 Ultra Chewable Tablets work better if taken with fats and oils. Many CoQ10 supplements contain oils in the base and are sold as liquid-filled soft gel capsules. All forms of CoQ10 will work better if taken with a meal containing fats, or with healthy supplements providing fat, such as our Rejuvenis Krill Oil. What about the quality of Rejuvenis CoQ10? The all-trans form of Rejuvenis CoQ10 Ultra Chewable Tablets are considered to be the best and most natural form available. Differences in absorption or utilization of CoQ10 products are mostly associated with oils and other compounds added to CoQ10 within a soft gel capsule. These differences are far less important when the supplement is taken at the same time as other oils or oil-based supplements in the diet, rather than between meals. This makes it possible to take CoQ10 in a vegetarian form and still enjoy the benefits of enhanced absorption. cellulose, silicon dioxide, vegetable stearate. tablets daily with a meal. Other Ingredients: . Vegetarian Product Rejuvenis CoQ10 products contain only the natural, all-trans form of CoQ10 produced by fermentation.